Slice the tomatoes into 1/2-inch slices and remove ends. Sprinkle slices with salt and let sit for a few minutes. Place egg and milk in a bowl and whisk until combined. In a separate bowl mix flour and pepper seasoning. In a third bowl, mix breadcrumbs and cornmeal. Heat oil in skillet on low-medium heat. Dip green tomato slice in flour and seasoning mixture, then in egg and milk mixture and finally in breadcrumb and cornmeal mixture. Fry the green tomato slice for approximately 2-3 minutes or until golden brown. Flip to fry the other side for another 2-3 minutes. These taste great with cayenne hot sauce. The first time I heard about fried green tomatoes, I must confess I was a bit skeptical. But the moment I placed a slice in my mouth and tasted the warm breading followed by its delicious tartness, I was hooked! 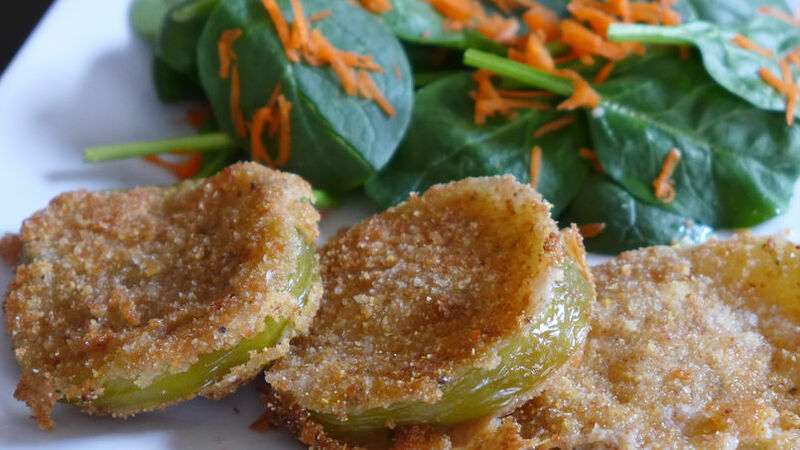 Fried green tomatoes make a great entrée or appetizer, too.